But that's just the beginning. Many of those bloggers went on to shell out $100 for the paid version of the class, which could mean hundreds of thousands of dollars for Hilary. Don't have an extra $ 100 to shell out on a course? That's ok, IFB has our very own Instagram Essentials course for $19 HERE. For any business owner, including fashion bloggers, it’s the ultimate goal: to amass thousands of readers or listeners, offer something of value, and then make money on the service. Easy, right? Heck. No. As any blogger also knows, accomplishing this objective is no small feat. Hilary dished out great advice in “Double Your Instagram Following,” to the point where she still sells access to the course's private Facebook community for a one-time fee of $297. Her other courses (“My Personal Style”, My Blog and Business series) are also hugely successful. But it's hard to ignore that there are plenty of similar programs out there on the market. 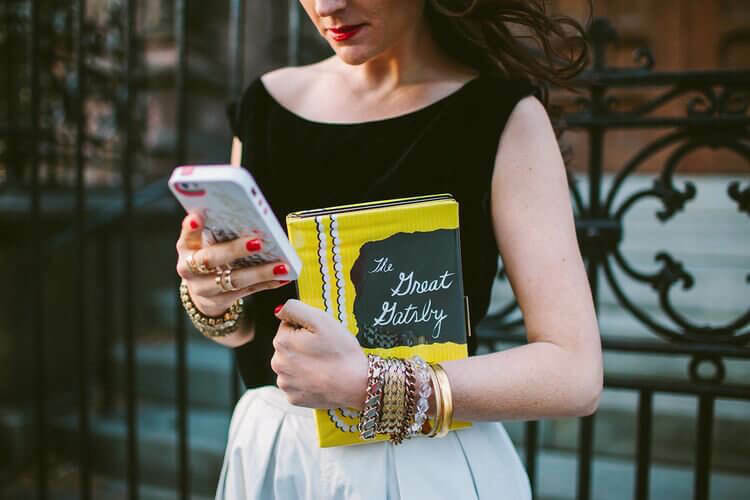 What made Hilary Rushford's Instagram course – and her other courses – so successful was the way she marketed the class. After all, it’s your money that helps make her business profitable. So the question is, how does she do it and how can you do the same for your blog? 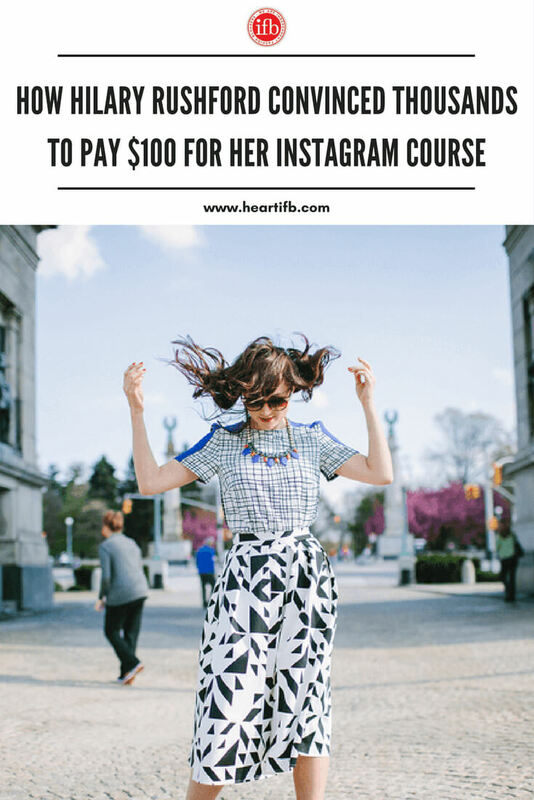 Hilary could have named her free Instagram class “Beautify Your Instagram Feed” or “Clarify Your Pitch on Instagram,” but she didn’t, although she does cover these topics in her course. Instead, she dug deeper and asked herself why these topics matter. At the end of the day, the biggest benefit is in gaining more followers—and that makes for a very compelling headline. So as a blogger, how are you making it clear what you’re all about and why others would want to know? On the surface, maybe it’s your outfits. But then, maybe it’s not just your outfits, it’s the fact that you’re providing style inspiration to other women in a traditionally un-stylish field. Or maybe you’re proof that suburban style is underrated. Or, insert your unique perspective here. Whatever it is, make sure this viewpoint comes across to readers so you can attract a likeminded audience. Hilary tells us why she’s uniquely suited to give us Instagram advice. And why is she the perfect candidate? This one’s easy—she’s done it herself! In her case, she even has a stat to prove it: she grew from 5K to 40K followers in 18 months. So what is it about your background, experience, city or lifestyle that make us believe what you’re selling? Give us the scoop! As I mentioned, Hilary doesn’t teach you everything she knows in her free “Double Your Instagram Following” class. The introductory course and next installment require payment. You can do the same: If you truly have something of value, provide the ABCs upfront, maybe even in exchange for something less daunting, like an email address. Then continue to reveal more information, little by little. Payment aside, this installment format has other benefits, too. Not only does it hold your readers’ interest, it also allows them to learn and absorb at a manageable pace. So if it makes sense for your site, consider adding tutorials as another potential payment opportunity to your blog arsenal, in addition to the traditional ads and sponsored posts. Word to the wise: professional video tutorials like Hilary's are an investment, so you'll want to choose your format carefully, get a sense of your audience's appetite and weigh the expense against the projected returns before diving in. Looking for tips and trick, when it comes to marketing your blog, brand or product on Instagram? Check out IFB's Free “The Ultimate Instagram Marketing Guide” HERE. I started off with the free course and then have been making my way thru the “Instagram with Intention” modules – have to say they have helped me so much! Even the free class just gave me a wake up call on the caliber of content I needed to be putting out there on Instagram to position my brand the way it deserves to be. I’ve been keeping track of my growth since I started the first class in June & in less than 3 months I went from 250 followers to over 360. Super encouraged and wanted to say THANKS Hilary!! I’ve taken Hilary’s course and it’s helping me grow much quicker than I thought! Started learning her tactics and I have almost doubled my followers in a couple months – granted I’ve only been blogging for 5 months! But hey, 3k isn’t too shabby! 🙂 Thanks Hilary! I actually took Heather’s free class which is geared towards business owners. While most of it was stuff you can figure out, having someone present the tips and tricks to you in a quick, engaging, easy to digest format can save you tons of time and money. I didn’t double my Instagram following but I have seen some serious growth and haven’t been spending all day on my phone to do it. The answer to that question is quite simple – you can learn it all on your own. And you should do a bunch of learning on your own, but courses like these just accelerate the learning process and can point a few tricks you can find out only if you try it out yourself. A lot of businesses aren’t in a situation where they have a big budget to invest in testing different schemes, and a lot of people don’t work in an agency where they can learn from different projects and campaigns. I got and email from her and I thought it was something different. I am glad she has such a great Instagram account, I will have to check it out. A good and informative article. I might have to check out these tips. I love how this article puts emphasis on picking a core based name for your product. I’m still brainstorming on a defining title for my Personalized Shopping Guide. On another note, I’ve taken 3 of Hilary’s webinars and always leave feeling inspired with a bucket loads knowledge. She’s pretty great! Great case study on what makes this course stand out from other similar courses…I love Hilary’s branding and trainings!! I took Hilary’s class and loved it! Yes, the material is not rocket science but it’s only $100 so it’s totally worth it. I’ve already doubled my following + some more. It is nice to have all the information in a neatly packaged format and Hilary is just a doll of a teacher! I’m not trying to make money off my Instagram guide and techniques, but those that have joined my “secret” Facebook group called “Instagram Posse” have WAY MORE than doubled their organic followings in a matter of weeks. One girl had her account grow from 450 to 9k in 2 months. Many accounts constantly own top hashtag spots too. I haven’t taken Hilary’s courses but I shell out exactly what I do to grow my followings and engagement numbers (now at 21k since starting this late July) FOR FREE. Why wouldn’t you want to help others out and to grow a community without charging people. Instagram is a free app. Anyone can take the time to figure out my methods (granted, do they have the patience or not is another story…). I don’t feel it’s right to charge for stuff like this. Share the wealth and knowledge among the interested Instagram community. Right? Talk about hypocrisy. Those guides are WAY more than $250 now and she just shells out follow/unfollow using MassPlanner and comment/like groups. Super shady. I’m reading this comment and am interested in what this person has to offer… but the website they linked to is up for sale now, so that doesn’t fill me with confidence! We have gone ahead and updated some of the links for Hilary’s courses – so please let us know if it’s not redirecting you to the right page. Thanks! Hey guys and gals, is there any way to get access to the full class. My wife missed the day to buy the full class and is really bummed. Thanks for the help. I missed the fb group! I was so gutted! I have signed up for the introductory class and I am quite excited! I have heard a lot of good things about it so fingers crossed! I just listened to her free instagram course and learned a lot! I am still thinking about purchasing it. I have so many courses and I am on information overload, but love instagram! 1. Confusing, wordy slides with very little useful content – though it was a free webinar, the slides themselves were so confusing (colours, fonts, organization, etc.). Losing credibility instantly imho. 2. She offers people to join an exclusive FB group of Instagram power users for a fee – I forgot how much exactly, but it was upwards of $250. In the meantime, there ARE free, helpful online communities around the web, serving the same purpose. 3. At least 30 minutes of the webinar was her promoting her other courses. That’s cool if you want to promote your stuff at the end of a free webinar, but (a) the webinar, the part where she talked about IG strategies, was extremely brief and not very unique; and (b) the promo was a substantial part of this free “webinar”. When she went on and on about her other courses, I started feeling slightly lied to. Haha. 4. After this, I unsubscribed to ALL of her mails, but I keep receiving these newsletters. I checked my subscription management status and it DOES say that I’m unsubscribed to all emails. Here’s just my brief experience with Hilary. Don’t hate – every product on Amazon has positive AND negative reviews. Her course had no useful information whatsoever and her company is the pyramid scheme / mlm company. Don’t be fooled guys! Her free course was terrible. I quit watching after 20 minutes it was waste of time. Talking too quickly, people asking her to slow down, but she didn’t care. Hard to follow and understand, no real content for someone who is in biz and understands a marketing a little bit. I would never spend a Peny for her services after seeing this free webinar. So far my worst webinar experience. I dont get why so many people are paying. For me this is good example how not to do it. I took the free course (I don’t think they are actually live by the way… seems pre-recorded to appear live), and found it informative. We learned some basic skills to improve any instagram page. However, I was completely shocked by how much she was charging for the actual classes. It really felt like a scam to me. I since kept receiving emails from her even after unsubscribing… very spammy. I did some research to see if the classes would actually be worth the money and was unable to find any success stories outside of the ones she was telling us. Honestly, something just seemed off to me. In a day and age where we can get so much of this information for free, I would be very careful about dropping that much money into a program with little credibility to back it up. I’m sure she has great material to offer, but for the prices she is asking, I wouldn’t do it. Just my opinion. yes the free course and the quality guide both have difference sometimes the things which you can get free of cost through the blogs and some things you can’t get through paid . so always focus on learn from blogs like this and do your own practice. Thanks admit for this informative post.